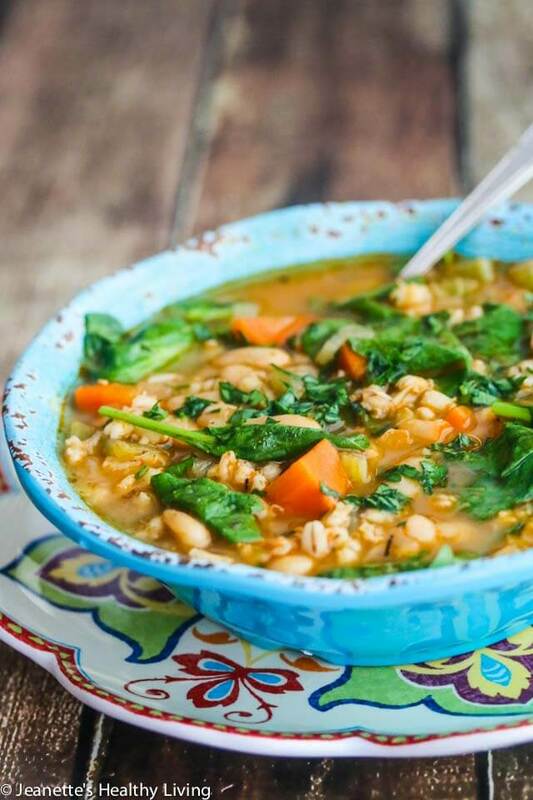 Spinach Vegetable Barley Bean Soup is a hearty nutritious soup, perfect for Fall and Winter. This vegetarian soup is an excellent source of vitamins, minerals, protein and fiber. A bowl of this nutrient-rich vegetable soup is a healthy and delicious meal in a bowl. 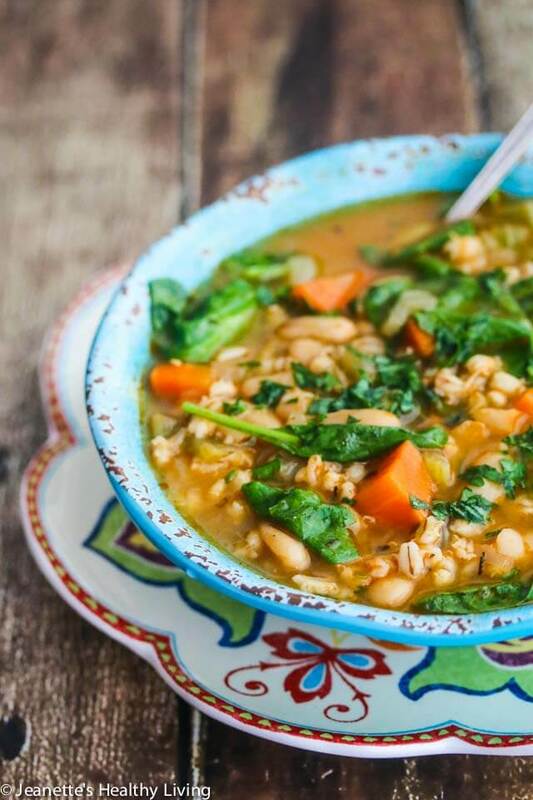 I first made this Spinach Vegetable Barley Bean Soup six years ago for a friend undergoing cancer treatment for breast cancer. 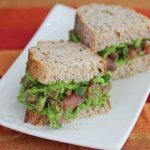 Soups full of vegetables, beans and whole grains are easier to eat for some cancer patients than entire meals. They’re hydrating, nourishing and comforting too. Homemade Magic Mineral Broth, made with mineral rich vegetables, forms a rich, flavorful base for this soup, as it does for other cancer-fighting soups I make. However, if you’re short on time, there are some high-quality organic broths you can buy. Sautéed aromatic vegetables – onions, leeks, carrots, and celery – add another layer of flavor. 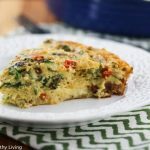 Each ingredient in this recipe has a purpose, whether it’s a source of vitamins, minerals, antioxidants, protein or fiber. 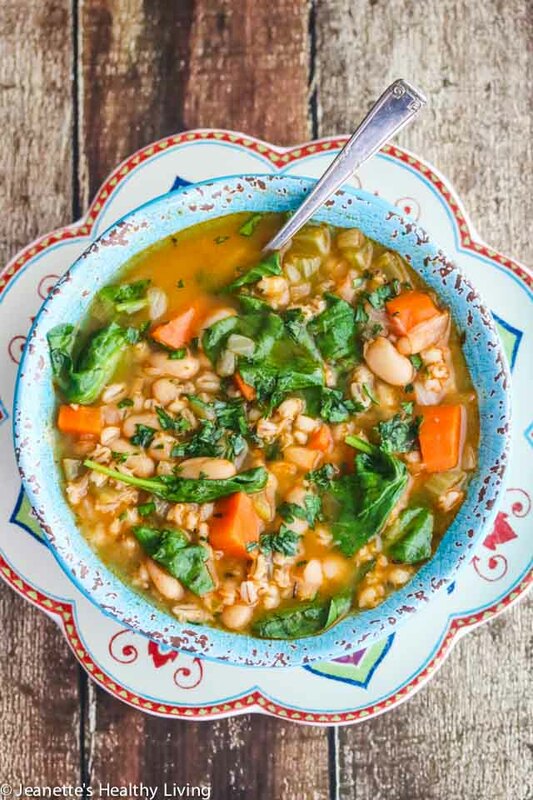 This Spinach Vegetable Barley Bean Soup is similar to my Lentil Vegetable Farro Chard Soup except it uses tomato paste instead of chopped tomatoes. 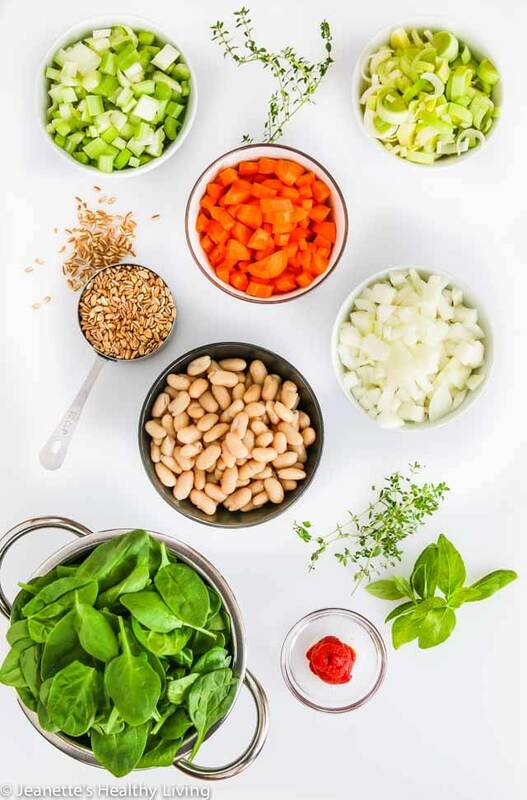 White beans substitute for lentils, barley substitute for farro, and spinach substitutes for Swiss chard. Barley is a whole grain that has a soft but slightly chewy texture once cooked. It typically comes hulled or pearled. Hulled barley is minimally processed and retains most of the nutrient-rich bran layer, and pearled barley has had most of the outer bran layer removed. You can also buy quick-cooking barley that is essentially dried pre-cooked barley (Trader Joe’s carries this). Barley is a very good source of fiber and selenium (which has antioxidant properties). It is also a good source of vitamin B3, and minerals (copper, magnesium, phosphorus). Barley contains the gluten protein hordein, so it is not gluten-free. Spinach is an excellent source of vitamin K, carotenes (antioxidants), vitamin C and folic acid. It is also a good source of manganese, magnesium, iron and vitamin B12. 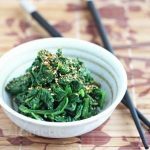 In addition to carotenes, spinach contains at least thirteen different flavonoid compounds that function as antioxidants and are believed to fight cancer. I use organic ingredients whenever possible for the cleanest soup – no herbicides and pesticides. Herbs are an important flavoring agent in this soup and contain antioxidants too. I always taste the soup several times once it’s finished cooking to adjust for seasoning. Since some of the broth will evaporate during the cooking process, I tend to undersalt during the cooking process, and then add sea salt and black pepper to the finished soup. Otherwise, you can end up with an overly salty soup. You can always add salt, but you can’t take it away. 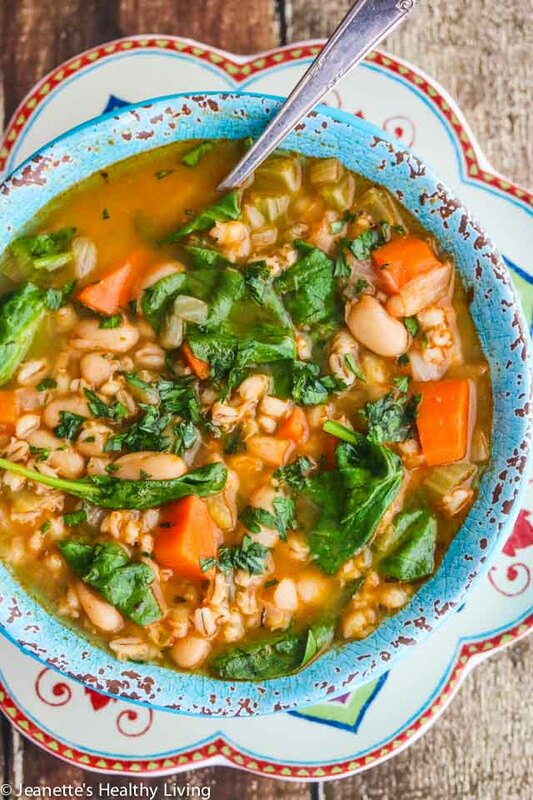 This Spinach Vegetable Barley Bean Soup will keep for a week in the refrigerator. 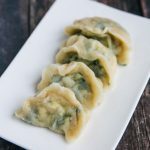 If you want to freeze it, leave out the spinach and freeze the soup. After you defrost the soup and reheat it, you can add the spinach. Note that beans tend to break down a little bit when you freeze them, so you may find that the beans don’t hold their shape as well once the soup is frozen. The taste is the same, just the texture is slightly different. 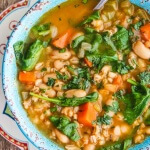 If you want to puree this Spinach Vegetable Barley Bean Soup for a smooth, creamy consistency, leave out the spinach and blend the soup. 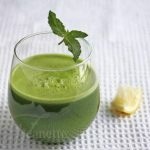 Then serve the pureed soup with a dollop of Spinach Basil Pesto. 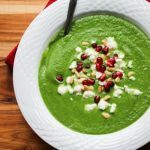 Puréed soups are great options for cancer patients who are experiencing side effects from cancer treatment such as mouth sores, difficulty chewing and swallowing and fatigue. Puréed soups are also good for anyone on a soft food diet. 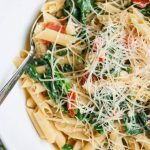 For more recipe ideas for cancer patients, see my Cancer-Fighting Recipes. Heat oil in soup pot. Add celery, onion, carrots, and leeks and cook over medium heat until softened, about 5 minutes. Add barley and tomato paste and cook, stirring, until the grains are coated and shiny, about 30 seconds. Add the broth, beans, thyme and basil, and bring to a boil. Simmer over low heat for 1 hour. 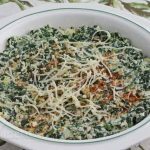 Add spinach, and cook until just wilted (if you use Swiss chard or kale, it will take slightly longer to cook). Remove thyme branch and wilted basil. Season with salt and pepper. Farro, brown rice or wheat berries can be used instead of barley. 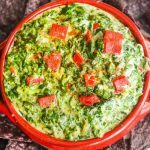 Swiss chard or kale can be used instead of spinach. Such a warming and delicious soup! I love your colourful serving set too. 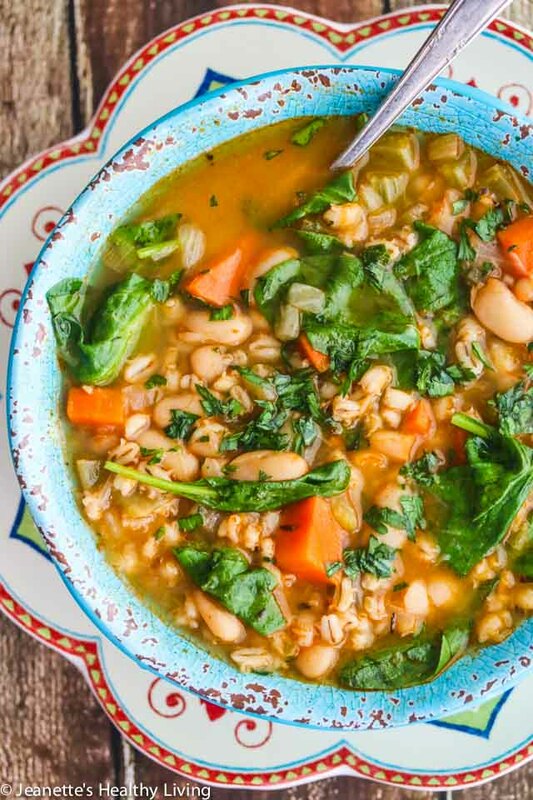 It’s very cold outside right now (in Denmark), so your beautiful pictures of your spinach and bean barley soup is very inspirational. 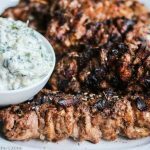 I will go down to the kitchen and make something similar, warm, delicious and tasty. Thanks for sharing! Sidsel – thanks for your comment – this soup and other hearty soups are perfect for cold weather. Would love to hear you end up making!